I have been making slow but gradual progress over the last week or so, mostly to do with the main quest. This includes trying to design an interior area as well as do a little scripting to help generate specific random items in particular circumstances based upon PCs statistics and attributes. The results are exciting to see and I look forward to hearing how players get on with this aspect of the module. On a more unsettling note, I appear to have lost contact with Hosa, who was going to be designing some exterior areas for me. The last email I had from him was over a month ago now, and even though he seemed quite positive at the time, I have heard nothing from him at all from all my last emails trying to contact him. I have not given up hope totally, but the lack of response is disheartening. I also had the opportunity to play a little of Wyrin's White Plume Mountain with a friend of mine. We don't play for long, but in the little time we did play, we managed to get our party together and equip ourselves. We did discover an error in the scripts that prevented players (apart from the main PC) and companions from acquiring the required XP and gold on start up, but it was easy enough to fix and I sent Wyrin an update to help him fix it. The error would not have affected anybody playing a SP game, but only those playing a MP game. If we discover any more MP bugs, I will be letting Wyrin know. As soon as the host player (SP or MP game) has finished reading the introduction to the module and established the background for the party, they will be introduced to the Party Creation Rules for the campaign. 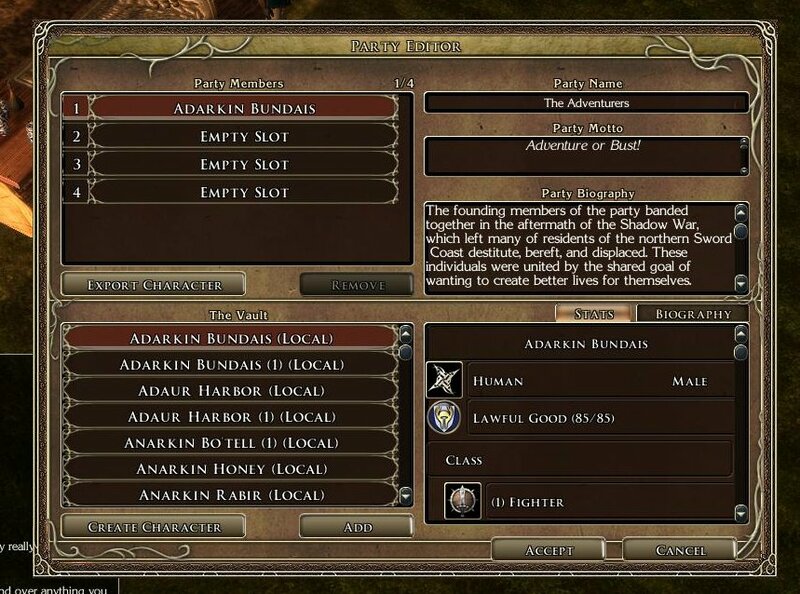 This information GUI basically explains which classes are not supported in the World of Althéa and therefore not permitted to join. If a PC is imported or created with any of these anachronistic classes in it, then they will be prevented from entering the world. 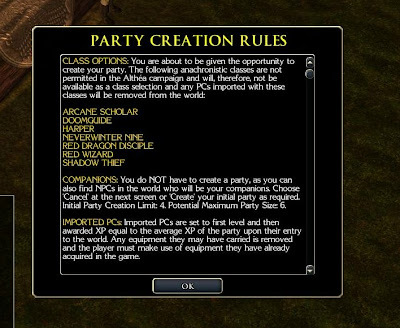 The same GUI also explains that party creation is not a requirement, but merely an option. 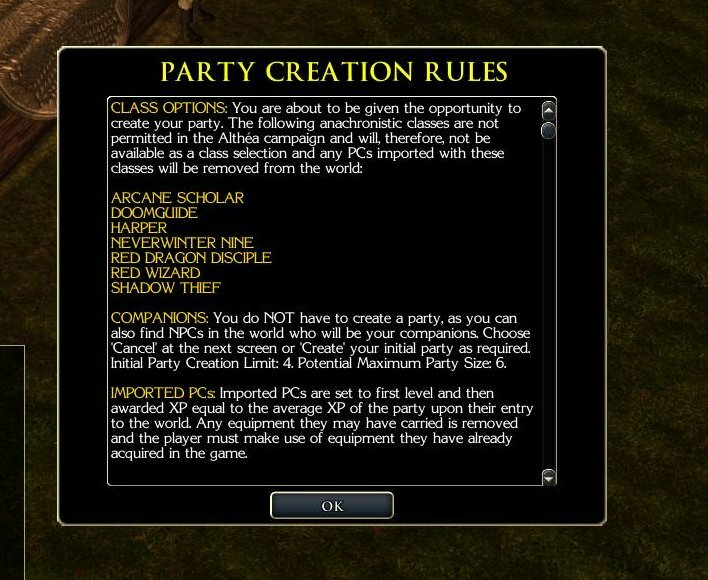 To begin with, if the player decides to take up the opportunity of rolling a party at the start of the game, then they are restricted to 3 additional PCs (to a maximum of 4) at this stage. This figure is reduced by one for each subsequent player that enters the world in a MP game. Whatever the player decided to do at the start of the game, later on in the game they have the opportunity to extend their party further. 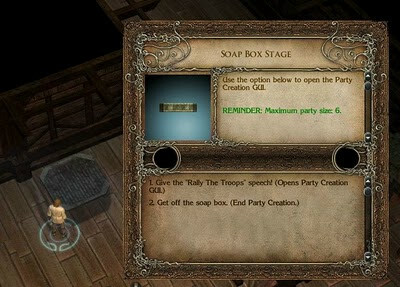 This can be done by going to the local tavern and climbing the soap box stage to rally some troops, which basically brings up the Party Editor GUI again. Depending upon how the player responds to the options and whether the game is a SP or a MP game determines what happens next. In most circumstances, the current party members will be automatically temporarily dismissed (allowed to wonder the tavern) while the leader of the party "gives the speech". Basically, the player is able to create more PCs for every blank slot remaining. In a SP game, this will be another 3 PCs. In a MP game, it will be 4 minus the number of players. In other words, if there are four players joined at this stage (the maximum number of players supported), then no more PCs will be able to be created this way and only companions can be added. a) What classes would you play if the party size was a maximum of 6 PCs? b) What classes would you play if you could play any party size (if not 6)? And tell me anything else about your party that would be interesting to know! Sorry to hear about the area design. Unfortunately, I don't have the time to directly help you with them, but I do hope to have a guide some time that might help you in making them. Also, you could make a post on the forums looking for help. Your numerous modifications to the game will likely not go unnoticed. My ideal party size is 4. A Ranger(archery), Cleric(healing), Fighter/Dwarvern Defender(tank), and Sorcerer(Evocation/Damage). They cover their weaknesses well and allow for a fair amount of creativity. However, that's only for a 'create your own party of 4' adventure. If I'm offered more, however, I'd probably take a rogue and probably another spell caster(Spirit Shaman). IN a party of 4, I can't really say there's a specific set of classes I use as it varies, but I can say that I'm more likely to multiclass rogues and spellcasters with other classes e.g. so my primary arcane caster may also be a ranger/wizard/assassin (backed up by a bard with high UMD), or a second line fighter may be a wiz/EK or a cleric/Dwarven Defender. 6 is good to have as an option for players from the feedback I've recieved, but can mean the player gets bogged down in character creation at the starts of the game if they have no premades and nothing else to do but churn out PCs. thanks a bunch again for all your help too! I vote for 5 party members, or at least that is what I am going for in my mod: 4 companions to provide the generally expected tasks (tank and healing, I suppose) and some specific sills/knowledges useful for the mod. So the player can comfortably be whimsical at character creation. Me, I would play the same class irrespective of the party size: I don't really like spellcasters so I mainly go for paladin, fighter or ranger. p.s. Your creativity always amazes me! It's interesting to hear you like to multi-class your PCs. I never find I can do that very well and tend to stick to single classes. If you do play my campaign, I would be very interested to hear what you ended up playing. So, if I understand you correctly, it sounds like you will only be creating one main PC (fighter type) and then looking for four supporting class companions to join you? Interesting to read about your different party styles. My own would probably be between 4 and 6 myself, subject to how difficult I was finding the combats. Ideally, I think I would like to play a party of four, inclding a fighter, a cleric, a wizard and a rogue. However, if I was finding things tough, I would consider adding another fighter, ranger or paladin. I'm probably too chicken to try playing any class outside of these. Four is pretty pointless to me because you are forced into the most generic, beat to death same classes and don't get to add any flavor classes. What classes would your party be made up of then? Well, in BG I almost always used all 6. Three melee, one each rogue or rogue/mage, wizard, cleric. In SoZ I generally used 5. Ranger with a couple thief levels, cleric, wizard, rogue/swash, and a cohort. Ranger runs in and melees with his animal companion (I normally got the dino companion), rogue/swash follows in a bit to get the sneak attacks. Cleric it depends, sometimes melee, sometimes support spells. wizard fires away of course. Any. Thats why I liked having 2 float classes. Usually there is a 2nd well armored fighter and lately I've enjoyed a bard instead of the 2nd wizard. Having just 1 capable melee seems odd though, so for sure I will always have two, one may be mixed with something. The more high ACs I have the safer I feel. Hi! I voted for three, a rogue, a warrior and a cleric/druid. If the party was of six I would add a spellcaster (probably a sorcerer), a bard and another tank (paladin). As I have said before six is the best. A rogue, a druid, a monk, a bard, a paladin and sorcerer. Thanks for the feedback. :) Your choices sound similar to my own, apart from the swash, which I have not yet experienced. I am definitely in agreement about having as high ACs as possible. That always seems to be my priority when equipping. ;) If you end up playing my mod, do let me know how many you did use in the end. Actually, there is a new mechanics regarding all spells, but it affects wizards probably the most. I introduce something called Arcaene Lore, which includes spells found on scrolls that can be cast all the while you have the spell remaining equivilent to cast it. In other words, if you found a Magic Missile Arcaene scroll, then you can cast Magic Missile using the scroll as many times as you have 1st level spells remaining. So, depending on how quickly you want to work with the mechanics available, it may be interesting to play a wizard with these potential new ways of casting in the offing. Lance, my preference has always been a party of 6. 2 Fighters, Cleric, Thief, and 2 Magic Users. Through back to my 1st edition pen and paper days. Gotta say, after the one time I was stuck in the 'Caverns of Eternal Ice' with a wizard that only had Ice Storm memorized(despite having orb of fire as a potential spell), I was sold on the sorcerer. The flexibility is simply too great. I know exactly what you mean about flexibility. Interesetingly enough, that is why I designed the system to give wizards more flexibility with spells. I had the system in mind even before the sorcerer class became available. :) However, as Arcaene Lore spells may not cover all your favourite spells quickly enough (you have to acquire them), then I can see why you would want to go with a sorcerer early on .... :) However, if you find enough Arcaene Lore spells to give you enough flexibility, then there is nothing to stop you enlisting a wizard later on. Yes, the response to "area designers" is going well. :) I have had three positive responses to date, which is indeed a blessing. Thanks for the encouragement to advertise.